For some people, any mutt from the local pound serves as the perfect addition to the family, while for others, it’s a particular pure breed or designer breed that is the only dog that will do. It goes without saying that you are going to pay more to get your hands on a designer breed puppy than a Heinz 47, so you will probably want one that is known to be fun, friendly, and a joy to have around. There are a few options here, but the Beaglier is one breed that checks all the boxes. These little guys are adorable, but they also need a little bit of care in the grooming department, so let’s look at how to properly bath them. Beaglier puppies do not need to be bathed as regularly as other breeds, as submitting them to a weekly bath will remove the natural oils in their coat that help keep it shiny and healthy. 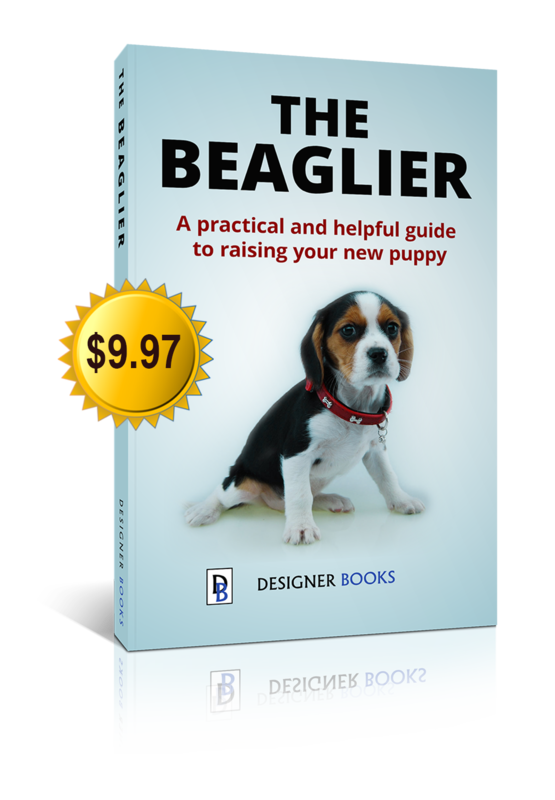 With a Beaglier puppy, you should consider giving him a little brush every day, but only for a few minutes at a time. This will help keep him looking good, whilst also allowing him to get accustomed to the feel of the brush or mitt. It’s a nice way to bond with your puppy, so make it a daily routine that you will both enjoy. Ask your Beaglier Breeder, when the last time your new Beaglier puppy had a bath to get an idea of when his next bath should be. In general, you should be bathing your Beaglier puppy about once per month. If you exceed that amount, you run the risk of his skin becoming dried out and itchy. One of the most important parts of bathing your puppy, regardless of breed, is paying attention to the water temperature. Hot water can be harmful to sensitive puppies, while cold water can feel like a bit of a shock to the system. Lukewarm water is the perfect temperature for your little guy. You should talk to your vet about the right type of shampoo for your Beaglier puppy, as you don’t want something that will have a negative effect on those natural oils. Most types of puppy shampoo will work just fine, and it might even be a good idea to stick with a specific brand of puppy shampoo that works, even when they move into their adult years. 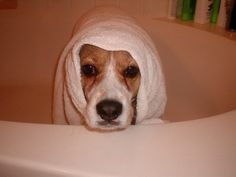 Poor quality shampoos can leave your Beaglier with itchy skin. Don’t simply go for the cheapest shampoo out there. After all, you have invested a lot of money on a designer dog breed, so be prepared to splash a little bit on quality bathing and grooming products. One area of a Beaglier puppy that you really need to pay attention to are the ears including his ear flaps. If left unattended, fungi and bacteria can form there and create a real issue. 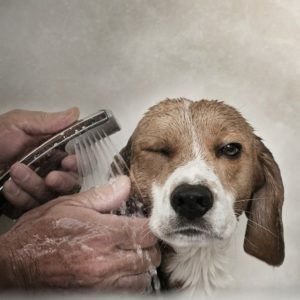 The ear flaps need to be cleaned weekly, so do not wait until bath time to take care of that particular spot. Wrapping a tissue around your finger and cleaning as far as your finger can get into his ear is the safest way to ensure that you do not go too far down his ear canal. 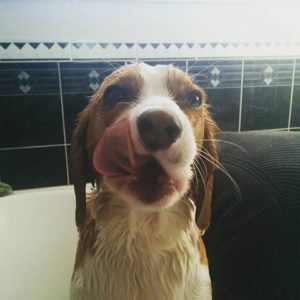 Bath time should be a fun time for you and your puppy, so get a couple of his favourite toys in the bath so that you can have some play time, and have a treat ready to go after he is all cleaned up.